I’ve been dusting off the cobwebs out of the corners on this site. I’ve been inspired as of late to revive the blogging habit. The problem is, other social media just makes what I’ve done here too easy, it made my blog redundant. So I fell off the wagon. But I figure in the coming adventure that is home schooling, having a place to expand upon our discoveries, seeing what works or more importantly doesn’t work for us, will be good for me. I know homeschooling is not for everybody and I’m bound to encounter strong opinions on this path. But so far, in our “no formal structure” routine, it has been fun (she is only 3.5 so keeping it fun and unstructured will be the course we take for a while yet). We are busy. Which also accounts for lack of blogging. 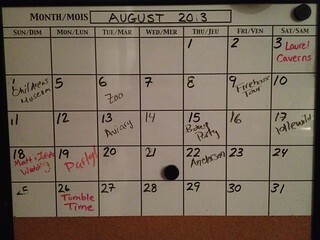 A snap shot of our monthly calendar inspired this post. And it’s not even a complete calendar. We have our weekly community playgroup to which I coordinate on Wednesdays. Thursdays is our regular playgroup which we’ve been a part of for over two years. Then there’s our new library day on Fridays, instigated by the story time changing days and Jana getting a library card for a weekly rotation of new books. Even though the summer hasn’t been great for it, there are trips to the neighborhood pool. Loads of fishing excursions with Dad. Weekend trips to Grandma’s. Her fall gymnastics class starts at the end of the month for Mondays. *deep breath* Yes, we are busy and I have no concerns about lack of socialization on Jana’s part. I have ideas for posts covering topics of why we’ve chosen homeschooling, first impressions of curriculum and manipulatives that I like and just trying to figure out how to “start” even though I feel every stay at home parent is a home educator. So here we go again, it will be in fits and starts getting off the ground again. One would hope, now that I’m on maternity leave that I’ll have time to catch up on the backlog of posts half written and photos to update. There may be a flurry of activity of back-dated entries, as is my custom, to have events chronicled by date in this blog. Which reminds me to spend time with Blurb putting together the latest book compilations of our blogs and photos before Epsilon arrives. I am going to be posting furiously over the next couple of days to get on top of my posts. I generally don’t like to make posts without their corresponding photos. I think they make the entries a little more dynamic, along with the links to places we’ve been and other information. But we are months behind on getting shots on Flickr and so, the text will flow in the form of back dated entries (some from as far back as March from my family visiting). I’ll slot in the photos later. 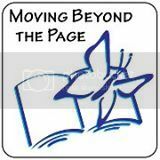 After a long, long, long sabbatical, commenting is now working on my blog. Mark helped me move to a different editor that has a much better spam filter. So, family, friends, this means you, comment away! Comments Off on Comments are back! For those reading my blog through its RSS feed, you might want to check back at my site for entries that you haven’t seen the updated versions for. They now all have photos to illustrate the story and I’ve been adding new details as they come to mind. This ends my Public Service Announcement.